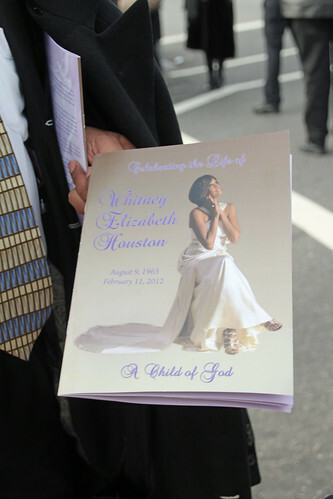 Whitney Houston funeral guest shows his program to journalists (photo by Christine A. Scheller). Whitney Houston’s family achieved the near-impossible for themselves and for her. They managed to hold a private “home-going service” for the superstar, and did so, in part, by graciously broadcasting that service to the world. I was in Newark, New Jersey, yesterday, embedded with an international pool of journalists on a corner a few hundred yards from New Hope Baptist Church, where the service was held and where Houston’s family has roots extending back a half century, according to the Rev. Dr. M. William Howard, Jr., pastor of Newark’s Bethany Baptist Church. The setting was an unlikely one, dotted as the neighborhood is with abandoned and half-built buildings. An exceptional, appropriate silence prevailed throughout a wide perimeter around the church. Local gangs reportedly even called a truce in Houston’s honor. When I spoke to Rev. Howard in preparation for my reporting, he expressed concern that fans would forget that, although Houston was a public figure, her untimely death is fundamentally a family tragedy. “If people have any kind of dignity and compassion, if they truly love Whitney Houston in the best sense of the word, they won’t go clamoring at the church, knowing they have no invitation,” Howard had said. Perhaps fans did, in fact, love her enough to stay away, because there were no crowds—only a couple hundred journalists, a significant police presence, and handfuls of fans keeping vigil several blocks away as limousines and luxury cars came and went. The Rev. Dr. DeForest “Buster” Soaries, pastor of First Baptist Church of Lincoln Gardens, New Jersey, has known the Houston family for decades. He shared his memories of the woman he called “Nippy” at CNN.com and provided commentary for the network with Soledad O’Brien, Piers Morgan, and the Rev. Jesse Jackson as the service got underway. “It was clear to me that their presentations had nothing to do with my dad, nothing to do with the family, and everything to do with them seeing the church full of people, and this big crowd. They were motivated to perform rather than serve,” said Soaries. Roberta Flack and N.J. Gov. 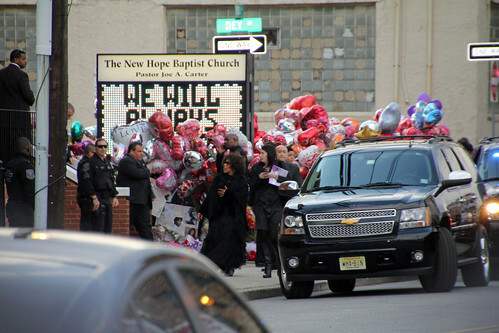 Chris Christie pass a sign that flashed "We Will Always Love You" and "Whitney Houston" as they leave her funeral (photo by Christine A. Scheller). Perhaps because they’ve dealt with sycophants for so long, the Houston family seemed to give the microphone only to those who would focus on their “Nippy” and her faith in God. “You paid a tremendous price in life,” Bishop T.D. Jakes told Houston’s family as he began his remarks. “You shared her with the world and we want to take a moment and say thank you.” Yes, thank you so much. Academy Award-winning actor Kevin Costner said he fought for Houston to play the leading role in her first film, The Bodyguard, and talked about the insecurities that both made Houston great and contributed to her decline. He said insecurities like hers are not unique among the famous. Media mogul Tyler Perry said there were two constants in his friend’s life: “a grace that carried” and her love for the Lord. Quoting from the Apostle Paul, he said neither the height of her fame nor the depth of her struggle could separate her from God’s love. “I would not condemn [ex-husband] Bobby Brown for Whitney’s struggles,” he said. This is what journalists call the "coffin shot": Whitney Houston's casket being carried out of New Hope Baptist Church after her funeral (photo by Christine A. Scheller). 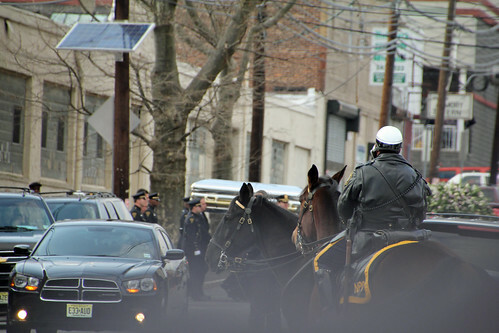 I felt like one of those people yesterday, showing up as I did to photograph and report on her funeral. Around me journalists jockeyed for shots of her casket being loaded into a hearse and for the inside scoop on why Bobby Brown abruptly left soon after the funeral began. Like them I took the coffin shot and reported what sources inside were saying about Brown because that’s what the world wanted to see and know. “What is the social madness? What is the social need that makes us virtually deadened to the family hurt and pain of this loss?” Howard asked. He would have liked to see Houston singing into her old age like Etta James (who died last month at 74 years old) did. “[James] had her own struggles, but she managed somehow to pull out of this,” he said. Perhaps the great lesson to be learned from Houston’s unlikely funeral is the one her family — rooted as it is in community, church, and gospel — taught us. Artists like her generously share their gifts with us. They don’t belong to us. They belong to the people who love and nurture them through the heights and the depths of their lives, and who send them home with grace when their battles are done. I loved The Rev. Dr. DeForest Soaries quotes – how blessed you were to have had the opportunity to chat with him. But your words – your final paragraph has me in tears. What a beautiful article, Chris! I pray the family sees this touching account.